Ethnic minorities in Stung Treng Province, Cambodia call on the spirits to stop the construction of the Lower Season II Dam. While described by proponents as a merely “tributary” dam, the construction of the Lower Sesan 2 (LS2) dam in Stung Treng province is causing immense fears of livelihood and ecosystem destruction . 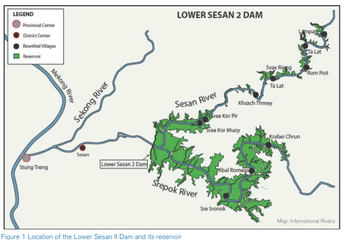 Located at the Sesan and Srepok River, just 25km before they join the Mekong River, the L2S, with a planned capacity of 400MW and a reservoir size of around 34,000ha, is in fact among the largest dam projects in Cambodia . First feasibility studies were conducted in 1999 but the proposal was rejected as being financially unattractive, carrying large social and environmental costs . However, new Vietnamese and Chinese investors expressed their interest and a Memorandum of Understanding was signed on June 15, 2006 to go ahead with Environmental Impact Assessments (EIA) and planning of the 977$ million dollar investment . Although the EIA did not meet international standards, the LS2 was approved for construction in 2012 . Forest clearing started in 2013 and construction work in 2014, accompanied by a growing number of access ways and illegal logging outside the concession area . The dam is planned to be operative in 2017 . Impacts on people and the environment will be devastating, but no proper consultation of affected people was held prior to the construction [1;3]. Upstream the dam, around 5000 people from 7 villages, comprised by Prov, Phnong and Lao ethnic minorities , will need to be relocated to make place for the reservoir  and an estimated 78,000 people will lose access to important migratory fish stocks . Resettlement land for the dispossessed was reported to overlap with protected areas and concessions land of other companies . Downstream, at least 22,000 people will be negatively affected by bad water quality and changing hydrology  and fish stock is expected to drop by almost 10% basinwide, while around 50 species will be endangered . Socio-ecological impacts in fact are expected to affect upstream Laos and downstream Vietnam, turning it into a transboundary issue . In summary, the dam will cause immense destruction of livelihoods, deforestation, habitat loss and large-scale ecological change . 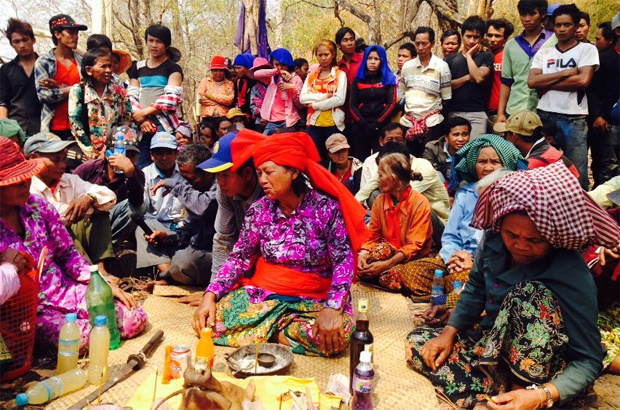 Since years, the affected communities voice their preoccupations. They started protests marches, submitted formal concerns, and called on the spirits to stop the project . Compensations, generally inappropriate, were refused . Due to the transboundary nature of the project, international donors (Australia, Japan, Finland and USA) urged Cambodia to submit the project for prior consultation to the Mekong River Commission, which however has not been done . Some NGOs submitted formal complaints regarding concerns of human rights abuse ; while others request a new EIA . However, it seems that the interests of investors and urban elites are above those of affected communities. Currently, it looks like that the project will go on, in spite of its devastating impacts. Development of Alternatives According to International Rivers, one of the campaigning NGOs, the recommendations are as follows : "1) The developers and RGC should recognize LS2’s severe impacts on the Mekong River’s natural resources, in particular fish, and livelihoods and food security of local communities not only inside Cambodia, but also over the entire Mekong River Basin, and reconsider the project. 2) The MRC and RGC should recognize LS2’s adverse impacts on the entire Mekong River Basin and consider the project not as a tributary dam but as equivalent to a mainstream dam, and submit it to MRC’s prior consultation process. 3) LS2’s negative impacts on the Mekong River’s ecology as well as life, livelihoods, and culture of local communities, indigenous/minority groups in particular, who rely on the river’s natural resources, should be more thoroughly assessed and weighed against the project’s economic returns. These assessments should cover not only Cambodia but the entire Mekong River Basin. 4) Sufficient information on LS2 and its resettlement and compensation plans should be disclosed to local communities who will be directly and indirectly affected by the project. They should be fully consulted and their views should be incorporated into final decisions." Why? Explain briefly. The project goes on and it does not look like that it is going to be stopped.